Official certified copies of Alaska Vital Records: Birth Certificates, Death Certificates or Marriage Certificates issued by Alaska government offices. Official certified copies of Alaska Court documents, including Certified copies of issued by Alaska courts. Copy Certifications By Document Custodian. Alaska's notaries do not have the authority to certify documents or photocopies of documents. When it is necessary to authenticate a photocopy of a document or a document has not been notarized at the time of issue it may be possible to use a process called Copy Certification By Document Custodian. Anybody except an individual functioning in the capacity of Notary Public can certify a document using this process. 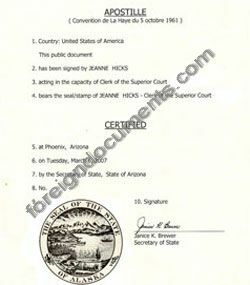 The person that is certifying the document signs a statement and their signature on that statement is notarized.